The RocketLinx ES8510-XT is a managed Industrial Ethernet switch, equipped with seven 10/100BASE-TX ports and three 10/100/1000BASE-TX RJ45/100BASE-FX/Gigabit SX/LX/LHX/XD/ZX combo ports. Two Gigabit ports may be used to form a nonstop Redundant Ring while the third Gigabit port enables connection to an upper switch, couple ring, or public server. The Gigabit combo port design provides flexibility to choose copper or fiber media supporting 100BASE-FX or 1000BASE-X, Multi-Mode or Single-Mode for a wide variety of distance and installation requirements. The RocketLinx ES8510-XT is housed in a rugged aluminum enclosure that features an excellent heat dispersing mechanical design and a wide operating temperature support. The embedded software supports full Layer 2 management features, multi-form ring redundancy, network control, monitoring, security and notification. The RocketLinx ES8510-XT also provides a built-in watchdog timer and digital input and relay output to avoid undetected problems. 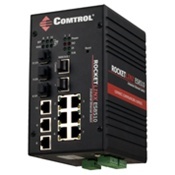 The RocketLinx ES8510-XT provides the perfect foundation for building your industrial Ethernet infrastructure. A unique feature to the RocketLinx ES8510-XT is the three Gigabit RJ45/SFP combo ports, which can improve performance dramatically compared to products with only two Gigabit RJ45/SFP combos. Each combo comes with a flexible connection -- 100Mbps or 1000Mbps, as well as fiber or copper connection options. All together, as many as ten different combinations of port connections are possible. By selecting the appropriate fiber transceivers, the RocketLinx ES8510-XT can meet your industrial application requirements with virtually any transmission distance. The RocketLinx ES8510-XT SFP socket supports 100BASE-FX Single/Multi-Mode and 1000BASE-SX/LX/LHX/XD Multi/Single-Mode transceivers. The available distance of the 100BASE-FX is up to 30KM. 1000BASE-SX Multi-Mode supports 550M, 1000BASE-LX Single-Mode supports 10KM, 1000BASE-LHX Single-Mode supports 30KM, 1000BASE-XD Single-Mode supports up to 50KM. 1000BASE-ZX Single-Mode supports up to 70KM. Dimensions 5.0" x 6.3" x 3.7"
Package Dimensions 11.3" x 5.5" x 9.1"